The use of the word abacus dates before 1387 AD, when a Middle English work borrowed the word from Latin to describe a sandboard abacus. The Latin word came from abakos, the Greek genitive form of abax ("calculating-table"), from Hebrew abaq (??? ), "dust". The preferred plural of abacus is a subject of disagreement, with both abacuses and abaci in use. Some scholars point to a character from the Babylonian cuneiform which may have been derived from a representation of the abacus. It is the belief of Carruccio (and other Old Babylonian scholars) that Old Babylonians "may have used the abacus for the operations of addition and subtraction; however, this primitive device proved difficult to use for more complex calculations". The use of the abacus in Ancient Egypt is mentioned by the Greek historian Herodotus, who writes that the manner of this disk's usage by the Egyptians was opposite in direction when compared with the Greek method. Archaeologists have found ancient disks of various sizes that are thought to have been used as counters. However, wall depictions of this instrument have not been discovered, casting some doubt over the extent to which this instrument was used. During the Achaemenid Persian Empire, around 600 BC, Iranians first began to use the abacus. Under Parthian and Sassanian Iranian empires, scholars concentrated on exchanging knowledge and inventions by the countries around them – India, China, and the Roman Empire, when it is thought to be expanded over the other countries. The earliest archaeological evidence for the use of the Greek abacus dates to the 5th century BC. The Greek abacus was a table of wood or marble, pre-set with small counters in wood or metal for mathematical calculations. This Greek abacus saw use in Achaemenid Persia, the Etruscan civilization, Ancient Rome and, until the French Revolution, the Western Christian world. A tablet found on the Greek island Salamis in 1846 AD dates back to 300 BC, making it the oldest counting board discovered so far. It is a slab of white marble 149 cm (59 in) long, 75 cm (30 in) wide, and 4.5 cm (2 in) thick, on which are 5 groups of markings. In the center of the tablet is a set of 5 parallel lines equally divided by a vertical line, capped with a semicircle at the intersection of the bottom-most horizontal line and the single vertical line. Below these lines is a wide space with a horizontal crack dividing it. Below this crack is another group of eleven parallel lines, again divided into two sections by a line perpendicular to them, but with the semicircle at the top of the intersection; the third, sixth and ninth of these lines are marked with a cross where they intersect with the vertical line. 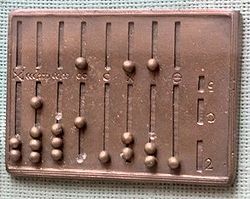 The Chinese abacus, known as the suànpán(? ?, lit. "Counting tray"), is typically 20 cm (8 in) tall and comes in various widths depending on the operator. It usually has more than seven rods. There are two beads on each rod in the upper deck and five beads each in the bottom for both decimal and hexadecimal computation. The beads are usually rounded and made of a hardwood. The beads are counted by moving them up or down towards the beam. If you move them toward the beam, you count their value. If you move away, you don't count their value. The suanpan can be reset to the starting position instantly by a quick jerk along the horizontal axis to spin all the beads away from the horizontal beam at the center. First century sources, such as the Abhidharmakosa describe the knowledge and use of abacus in India. Around the 5th century, Indian clerks were already finding new ways of recording the contents of the Abacus. Hindu texts used the term shunya (zero) to indicate the empty column on the abacus.. In Japanese, the abacus is called soroban (? ?, ??? ?, lit. "Counting tray"), imported from China around 1600. The 1/4 abacus appeared circa 1930, and it is preferred and still manufactured in Japan today even with the proliferation, practicality, and affordability of pocket electronic calculators. The use of the soroban is still taught in Japanese primary schools as a part of mathematics. The Chinese abacus migrated from China to Korea around 1400 AD. Koreans call it jupan (?? ), supan (??) or jusan (?